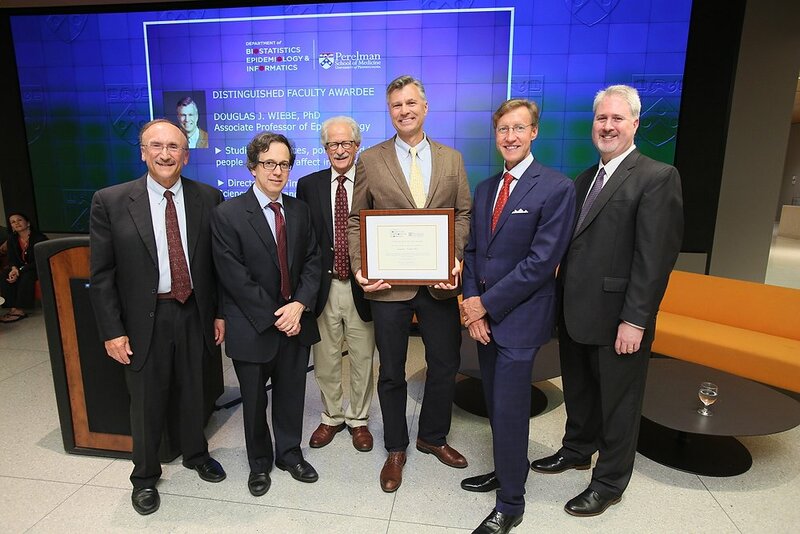 In 2017 the Department established the DBEI Distinguished Faculty designation, which recognizes exceptional faculty members whose work epitomizes the successful synergies across its three core disciplines to promote health, science and education. 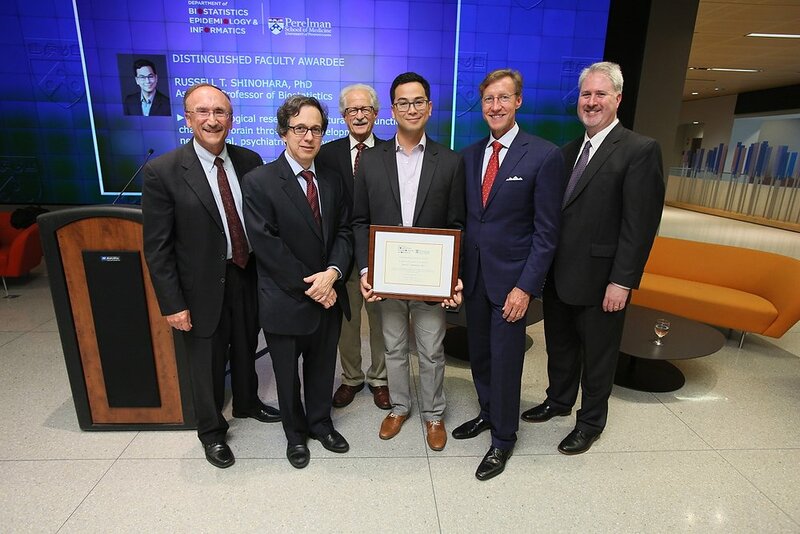 At the Department's name change celebration on September 6, Perelman School of Medicine Dean J. Larry Jameson, MD, PhD (second from right, below) joined (from left) Chair Harold I. Feldman, MD, MSCE, and Division Directors Stephen E. Kimmel, MD, MSCE (Epidemiology); J. Richard Landis, PhD (Biostatistics); and Jason Moore, PhD, FACMI (Informatics) in honoring the first four recipients. 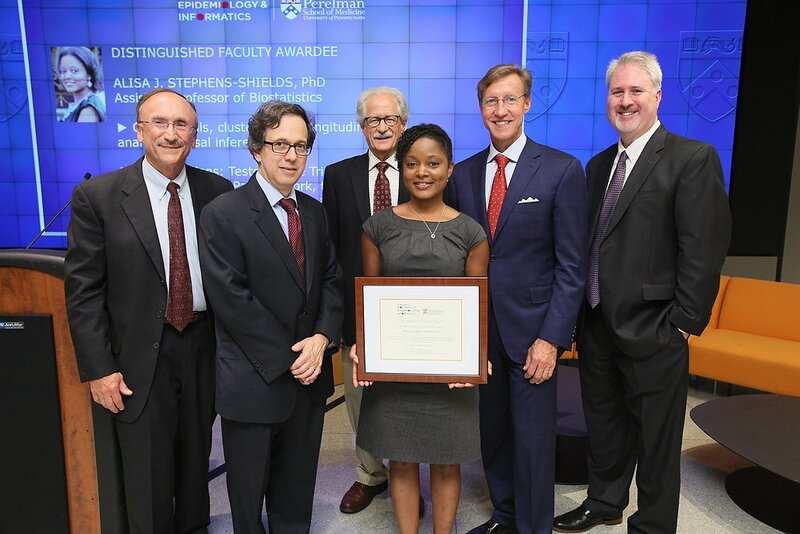 Dr. Stephens-Shields leads a research program centered on causal inference, clinical trials and clustered and longitudinal data analysis. Her methodological and applied research sits squarely at the junction of our three disciplines. Her current collaborations include the Testosterone Trials, the Multidisciplinary Approach to Pelvic Pain Network, and trials to evaluate the effectiveness of financial incentives in increasing medical adherence and research participation. Dr. Wiebe leads a vibrant research program in injury science. His work creatively incorporates high-dimensional geospatial data to study how the urban environment, policies and the locations where people spend their time influence their risk of injury and their overall health. He directs the SpaceTimeEpi Group and the Penn Injury Science Center. Dr. Wiebe also leads a highly creative training program to build capacity for injury and trauma epidemiology in Botswana. Dr. Ogdie-Beatty focuses on the pharmacoepidemiology of psoriatic arthritis. 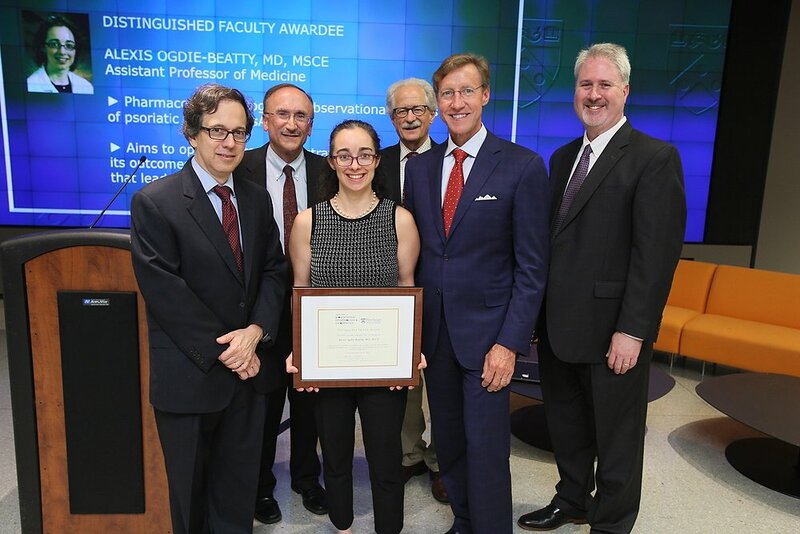 Through her creative, interdisciplinary research program, she has enhanced our understanding of the physiological aberrations that lead to this potentially devastating disease and innovated treatment strategies that optimize clinical outcomes. Dr. Shinohara leads a research program that develops methods to assess the structural and functional changes in the brain throughout the lifespan. His work also guides us in using neuroimaging to manage neurological, psychiatric and developmental disorders. His many scientific contributions are the product of a robust integrative research program that sits at the intersection of our three disciplines and that informs a broad array of observational and interventional studies.